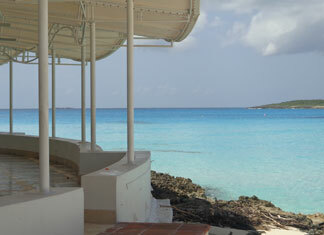 There are endless opportunities for romantic moments on the special island of Anguilla. 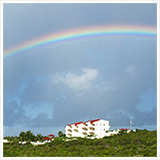 It's no wonder so many people choose Anguilla for romantic getaway vacations, weddings, honeymoons, and anniversaries. Sometimes the shared romantic moments may come just from witnessing the exchange a simple smile from a local. Sometimes they are in the form of a peaceful and alluring sunset, alive with the prettiest of colors. 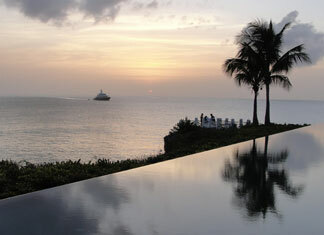 Yes, romance comes easy in Anguilla. I've heard many stories of those who fall in love with their significant others in Anguilla and they both fall in love with the island at the same time. While it's easy to set out on your own and have a relaxing or adventurous bonding day with your partner, here's part one of Anguilla-beaches.com romantic itineraries in case you are looking for some guidance. First, smile… you are in Anguilla! Second, grab your bathing suit and something else to change in to. This day starts off at one of our favorite spots - da'Vida. 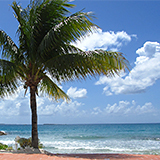 DaVida is located on Crocus Bay and is the only business on that beach. It's also centrally located should you be staying farther west or farther east. 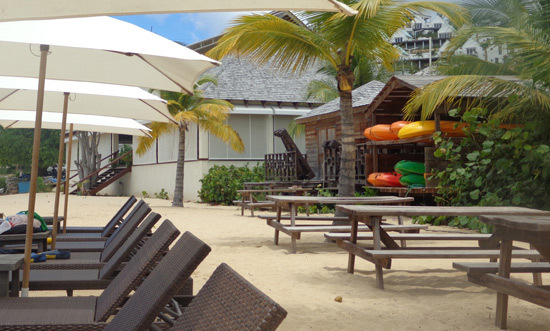 Drive to da'Vida and grab yourselves two of their comfy loungers on the sand. da'Vida itself is pleasing to the eye. It's not very old, it's Caribbean chic and the aesthetics of the place alone may induce a happy, loving feeling in your heart. Ideally you'll arrive around 11am, so let me recommend kicking off your day with a cocktail or a cold drink as you lounge and take in the view, after all, you're on vacation. 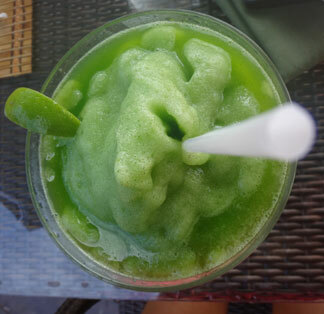 The frozen mojito is delicious and popular. 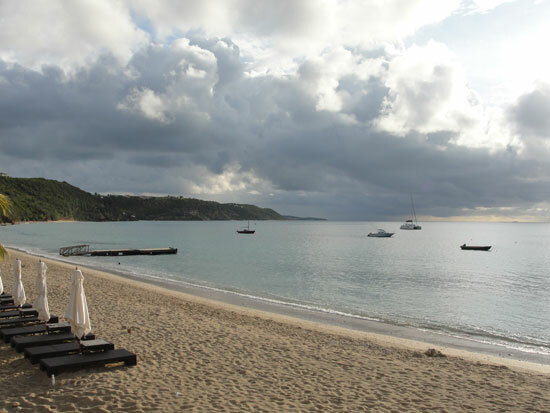 Good to know in advance, Crocus Bay is a decent walking beach. It is different from many in that the sand a little darker than most Anguilla beaches and it is dotted with rocks more so than seashells. I find this beautiful and unique and hope you will too. Even better, the rocks vary from neutral to jewel tones of purple, blue, green and muted reds. After you've lounged, perhaps go for a walk down the beach… you'll pass an old stone building which sets a nice mood if you respect history and craftsmanship. When you're done strolling and exploring together, a dip in the sparkling bay might be calling your names. Those feeling the full effect of vacation might even enjoy a post-dip nap on the lounger. 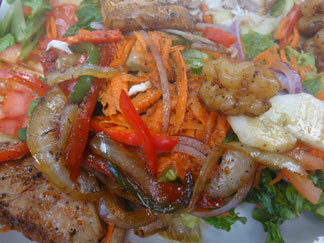 When you wake up, lunch at da'Vida's Bayside Grill is right there, a few steps away. Their seafood salad is delicious but you can't go wrong with anything on the menu. After you've satisfied your need for nourishment and have gotten to know Crocus Bay, it's now time you and yours rent a kayak (right there on the beach at da'Vida…easy!) 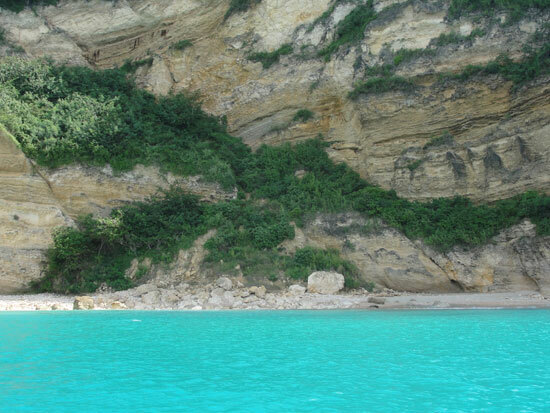 and paddle yourself over to one of THE MOST ROMANTIC nooks on the island - Little Bay. I say this because, while I've never seen it overrun, you may have boaters and hikers there as well. Also note, I have been there for several hours with no sight of anyone else. Little Bay is naturally more likely to have more visitors during the busier months on the island of late November through Easter. Since we can all share and those there will all have one thing in common, they've either heard or know how spectacular Little Bay is. Please take the opportunity to rest in your kayak and gaze up at the striated-looking rock that is a large percentage of what surrounds you at the bay. Take in this special place. Swim, rest on the beach, climb the rock. Please note if you aren't the kayaking type, click the link and read about Calvin and his easy boat ride option to from Crocus Bay to Little Bay. 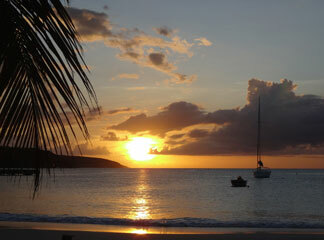 If you did kayak over, keep an eye on the time, or the sun rather, so you won't be returning to Crocus Bay in the dark. You will want to be in a spectating position for sunset because Crocus Bay gets some magnificent, heart-warming sunsets sure to once again, bring forth smiles and possibly some hugs and kisses. This will be the Crocus Bay romantic day finale! If you don't feel like getting cleaned up, you could just stay put and have your dinner at da'Vida - again, you can't go wrong. Don't worry about staying on for dinner… it's the Caribbean and it's a casual environment so you can relax and enjoy. If it is time for some refreshing and sprucing, you'll have lots of options for a romantic dinner in Anguilla. End your happy, romantic, special day with an evening of fine dining. The food is scrumptious, the hosts are loving and the setting is ideal. Sunsets, the sound of the sea, perhaps some wine in a spacious seating area might just make you feel so warm and fuzzy you never want the experience to end! The food is so satisfying and the setting is perfectly dimly lit at E's Oven. It is a memorable experience even without the sound of the surf as your background. Soft music and a relaxed but elegant environment are enough to set a special evening in motion. The details at Hibernia and the delicateness of the hostess, let alone the beauty of the restaurant both inside and out make Hibernia one of the top spots for a romantic dinner in Anguilla. Hibernia also has a long-time following and is a mostly quiet and distinguished experience. A unique trait of Hibernia is the art gallery and gifts. Start your evening with a walk-through of the gallery... a collection from the owners' travels throughout the world. Pimm's at Cap Juluca is perhaps the most beautiful place to sit out of the highlighted romantic restaurants. The restaurant sits on the eastern side of gorgeous Maundays Bay which is subtly lit near the restaurant a night allowing for a romantic glow of the pale turquoise sea. 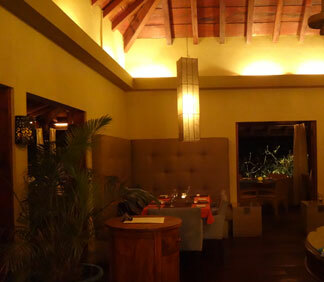 The ambiance is romantic and the restaurant even offers tapas which can be a romantic way to dine...by sharing. Entrees like Wagyu beef and fresh local crayfish, top-notch service and in a luxurious, chic atmosphere overlooking the point of Meads Bay is what you'll find at The Viceroy's Coba. 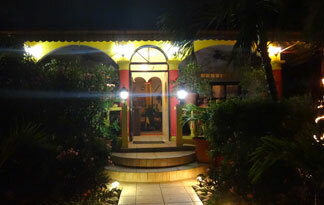 This is another one of Anguilla's romantically lit restaurants with quality dining. Spacious and luxurious, you will feel pampered and who doesn't like to feel pampered as you celebrate a fulfilling partnership? Veya at night is just right. Veya is set in what feels like a romantic treehouse on the hillside in Sandy Ground, Anguilla. 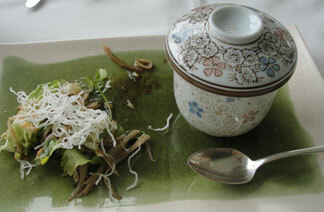 The food is wonderful, the service is good and the atmosphere is lush. Be sure to check ahead for an evening complete with live music. Veya's "Cuisine of the Sun" is a brilliant finale to a quality day in Anguilla.